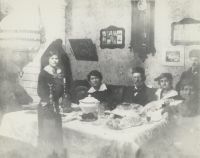 The family was living on Maxwell Street when he was born. Victor and Rita lived at this address starting in 1935. Rita continued to live there after Victor passed on. She died thee in 1960. His original name was Abe, he late came to be known as Victor. 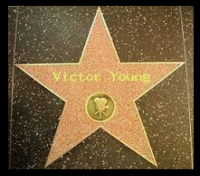 Victor Young was born on August 8, 1900 in Chicago, Illinois to a musical family. 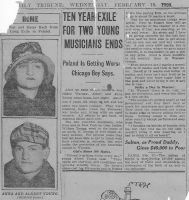 His father was a tenor with the Chicago Opera and by the age of 6 Victor was beginning to play the violin. 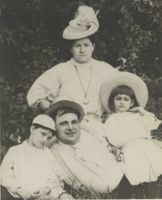 After the death of his mother in 1908, Victor and his sister Helen were sent to Warsaw Poland to live with his grandparents. His grandfather was able to send him to the Warsaw Conservatory of Music and being a willing pupil he graduated and made his debut as a concert violinist with the Warsaw Philharmonic. Still a teenager, he went on a successful tour of Europe and the United States, enhancing his career as a concert violinist even further. He returned to Chicago in the 1920's and accepted a position as a musical director for the Balana and Katz chain of movie theaters. This required him to arrange music for the most important presentations. As a result of this Victor discovered his talent for composing, arranging, and orchestrating popular music. 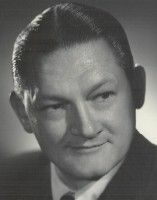 Within a few years he had moved to Los Angeles, signed a contract with Brunswick Records as a conductor, and had become the best-known music director for radio and records. 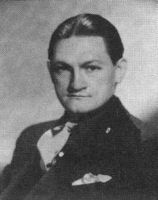 In 1935 he accepted a position from Paramount Pictures as a musical director, composer, and arranger. For the next 20 years Hollywood was to become his home and film music his main profession. He scored over 300 films during the next two decades, compiling 22 Oscar nominations along the way Victor had the ability to be able to produce wonderful melodies for films no matter what the subject matter. While films like "Love Letters" and "My Foolish Heart" are long forgotten, the theme songs are still performed today by a variety of pop and jazz artists. He may have been the best melody writer that Hollywood has ever had. In his later years he revealed that he had found inspiration and kinship from Rachmaninov, who had also settled in Los Angeles about the time that Young did. Films such as "For Whom the Bells Toll", "The Quiet Man", "The Blue Dahlia", and "Samson and Delilah" showed his versatility for all types of productions, from film noir to biblical. When once asked why he became a film composer he shook his head. "Why, indeed? Why would any trained musician let himself in for a career that calls for the exactitude of an Einstein, the diplomacy of Churchill, and the patience of a martyr? And yet I can think of no other musical medium that offers as much challenge, excitement and demand for creativity in putting music to work." This perhaps was the reason why he worked so hard and continuously for the twenty years he was involved with Hollywood. The frantic pace, poor diet, cigar smoking, and ignoring the advice of his doctor took its toll in 1956 and he passed away from a stroke on November 11, 1956 in Los Angeles. Even in failing health in his last year he did scores for "The Brave One", The Buster Keaton Story", "Omar Khyyam", and "Run Of The Arrow", all released after his death. His last score "China Gates" was completed by his long time friend Max Steiner. Sadly, his only Oscar came after his death in the spring of 1957 for "Around the World in 80 Days", perhaps his finest achievement. His passing symbolized the end of an era in Hollywood. Within a short time the music departments at 20th Century Fox (Alfred Newman), Warner Bros. (Max Steiner) and Paramount (Young), were dismantled, and with them went the romantic films scores that all were famous for. Even with the revival and re-recordings of golden-age film music, Young's film music has been basically forgotten. Perhaps the new recordings of "Scaramouche" and "The Univited" are hints that other scores are in the works for release. One can only hope that such a prolific composer can be enjoyed by future generations. On this date in 1956 I lost my favorite family member, my uncle, and the world lost a musical genius. 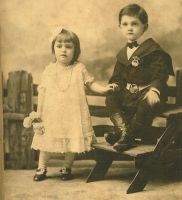 Victor and my Aunt Rita were Beverly Hills residents from 1935 until my Aunt's death in 1960. They lived at 526 N. Elm at the corner of Elm and Carmelita. It is hard to believe it is 59 years since he died. I loved him very much and I know he loved me. Continued RIP Victor Young. Victor Young- publicity photo. Bobbie Fromberg says this is how she remembers her uncle.